Dutch lighting pioneers EVA Optic are gaining attention across the UK, following the implementation of its high-efficiency ambient lighting in the pool hall at the new multi-million pound leisure centre project at Waltham Abbey in Essex.Having completed more than 900 sports and leisure centres, including 500 swimming pools, project lead Pellikaan Construction, specified EVA’s revolutionary LED lighting – available exclusively through Golden Coast in the UK. It helps to reduce energy costs and environmental impact, while delivering long-term reliability and meeting Sport England’s strict lighting rules. 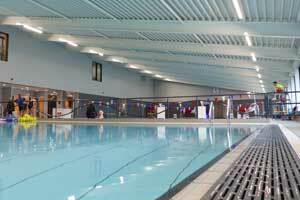 Electrical contractors Barrie Beard successfully secured the tender for electrical installation, which includes 26 EVAline LED lights for ambient lighting in its large pool hall, which comprises a 25-metre pool and a 15-metre learner’s pool. “Our original design for the pool was in the form of flood lighting – both direct and indirect,” recalls Barrie Beard Associate Director Darren Stokes. “This type of installation is widely used. However, in some installations it can negatively impact the finish of the wall and the building as it can highlight imperfections. EVALine LEDs are manufactured from materials suitable for use in a challenging environment like a pool hall, where heat, chlorine and humidity create issues. EVA’s light body components and fixing materials are manufactured using hot-dip galvanised metal, duplex-coated or anodised aluminium. What’s more, units benefit from anti-overheating technology to ensure at least 50,000 hours of use. Barrie Beard has worked with Pellikaan Construction for around 30 years on leisure industry projects like Waltham Abbey. But, while Pellikaan have employed EVA on quite a few leisure centre projects in Europe, this was the Barrie Beard team’s first introduction to EVA and their exclusive UK distributor Golden Coast. 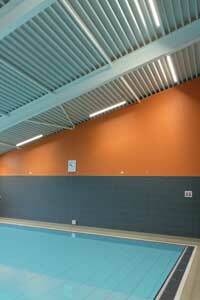 “The EVA lights look great in place,” enthuses Darren. “And they were easy to install, too. However, we did know that if anything did arise, we just had to give Golden Coast a call for help. Hearing news of the project, Shaun Adams of Golden Coast, EVA Optic’s UK distributor, said: “On projects like these, the expertise and in-depth understanding of wet leisure lighting that EVA offer is invaluable. “It’s easy to understand why their ground-breaking LEDs are making waves beyond swimming pools, in settings as varied as Bentley factories across Europe and the Tesla plant in the Netherlands.